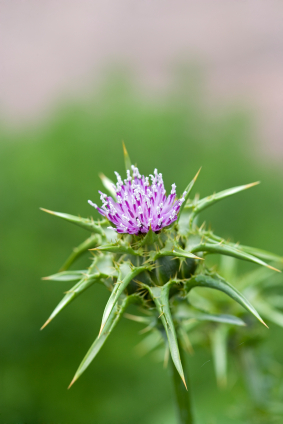 Silymarin milk thistle is one of the most important antioxidants — it helps the detoxification process while regenerating the liver. Although many people detox to really clean out the body, some detox programs can be pretty heavy going. You often don’t eat for several days, or your diet is very strict, and you sometimes have headaches, fatigue and other symptoms as the toxins get stirred up. But when you live in a fairly polluted environment — which most of us in the U.S. do — and eat foods laden with pesticides herbicides, hormones, antibiotics, and chemicals, it’s important to get rid of the stuff that accumulates in the body. If you don’t have the time to put into a full detox program, you might try milk thistle as an alternative. What is milk thistle’s secret? The somewhat obscure antioxidant known as silymarin. Unlike other antioxidants, silymarin works directly on the liver, the organ we depend on to get rid of toxins. In fact, silymarin not only helps the liver in the detoxification process, it actually generates new liver cells. It aids in the proper metabolism of fats and prevents blocked arteries, excessive weight gain, sluggish metabolism, cellulite and other fatty deposits. It strengthens the immune system to help prevent a wide range of symptoms, ranging from allergies to chronic fatigue syndrome. It protects from chemical sensitivities. It helps stabilize the blood sugar and control sugar cravings. It prevents nervous system disorders like depression, anxiety, mood changes, feeling foggy, or poor concentration. It helps balance the hormones. Chances are, you have some of those symptoms right now. Silymarin can change all that. While many detox programs are hard on the liver, silymarin gently helps the detox process while regenerating the liver and making it stronger. If you’ve been looking for a detox product that works for you but doesn’t require taking a week or two off work to complete, try silymarin milk thistle. It may be all the detox you and your liver need.